Layered with a creamy fudge frosting, this easy-to-make cake is moist with a deep chocolate flavor. My favorite choice for a classic celebration cake! And the best part? It’s both easy and quick to put together. How can you not love a recipe that’s that simple (and that delicious)? Raise speed to medium, and add eggs, buttermilk, water, oil, and vanilla. Beat until smooth, about 3 minutes. Let cool for 15 minutes. Turn out from pans. Transfer, face up, to wire racks. Let cool completely. To make the frosting, sift together sugar, cocoa, and salt. Beat cream cheese and butter with a mixer on medium-high speed until smooth. Reduce speed to medium-low; gradually add sugar-cocoa mixture, and beat until combined. Pour in chocolate in a slow, steady stream. Add sour creme ; beat until combined. 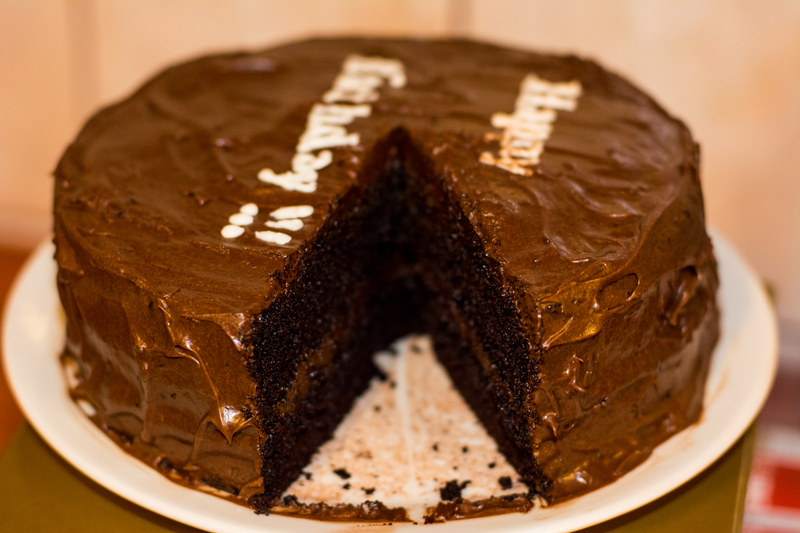 Spread 2 cups chocolate frosting onto top of 1 cooled layer of cake. Top with remaining layer; frost top and sides with remaining 2 cups frosting. Decorate with fruits and other decorations that you like ! Homemade cakes are the best. Your chocolate cake looks delicious! Looks great Anita. 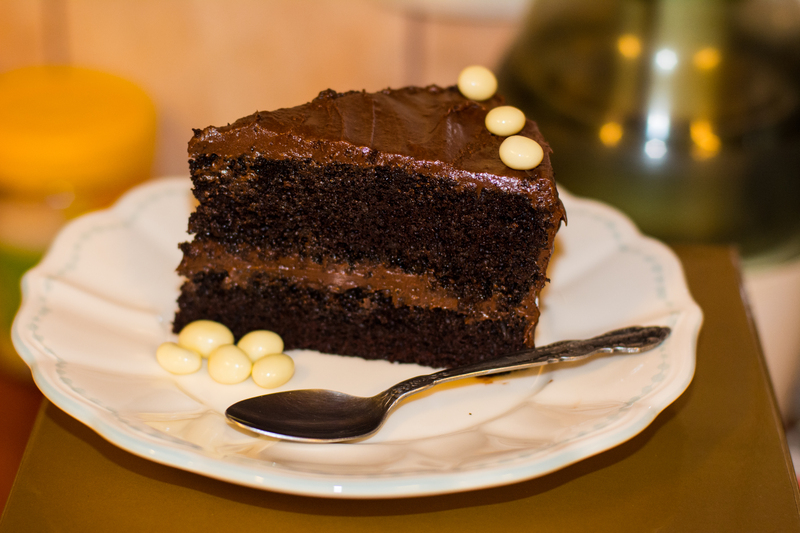 Love chocolate cake. Looks and sounds so good! Cream cheese in the frosting, I’m sold. Next choccy cake I’m making is this one. 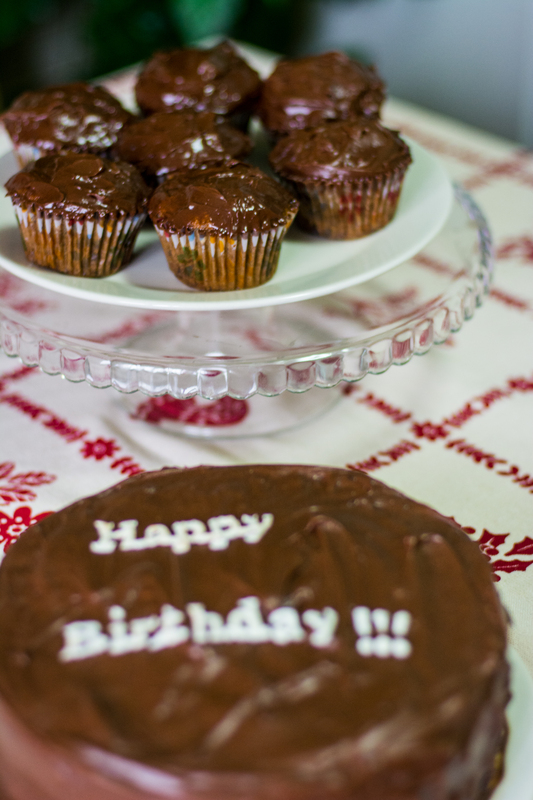 Chocolate cream cheese frosting is probably my favourite! Oh just beautiful, we were on the same wavelength when we thought of chocolate and cupcakes this week eh? The addition of buttermilk must have really made these moist. This looks so delicious! I love chocolate!